Yesterday Fox News posted a story that provided some perspective on the current sequestration debate. The sequester is expected to take a $85 billion bite out of the fiscal 2013 budget, though only half of that impact is expected to be felt this year. But lawmakers say the government already has $45 billion in unspent money which could be used to offset the shortfall. Rep. Tom Price, R-Ga and Sen. Marco Rubio, R-Fla. introduced legislation on Tuesday that would require the director of the White House budget office to rescind funds that haven’t yet been obligated. Republican Sen. Tom Coburn has also identified several programs at the Pentagon he’d set aside, including a video called “grill sergeants” in which the instructors show their favorite recipes; money for a plan to send a space ship to another solar system; funds to find advancements in beef jerky from France; and $6 billion on questionable research, including what lessons about democracy and decision-making could be learned — from fish. I have enough input into my decisions–I have no plans to consult my local fish. Please follow the link above to see some of the places where money is available and government spending can be cut. The upside of this discussion is that it will bring attention to government waste. Hopefully we can learn from our past overspending and cut our spending in order to reduce the credit card bill we are handing our children. The International Business Times is reporting today that rising royalty costs will cause the free music site Pandora to limit free listening to 40 hours a month. That works out to a little more than one hour a day. Pandora is lobbying Congress to pass the Internet Radio Fairness Act which would change the way that royalties are paid to artists. Listeners will have alternatives to the 40-hours-a-month program–99 cents for unlimited listening for the remainder of the month, a subscription to Pandora One for unlimited listening and no advertising. I enjoy Pandora and hope they will continue to provide free Internet music. I Can’t Post This Often Enough! As you listen to the scare tactics, please keep this graph in mind. Last night I had the pleasure of meeting Massachusetts State Representative Shaunna O’Connell. Shaunna represents the Third Bristol District, which includes most of her hometown of Taunton and Precinct 6 in Easton. Shaunna was elected in 2010. Since taking office she has worked to reform the Electronic Benefits Program (EBT) in Massachusetts, which has been rife with fraud. She has worked for more accountability to the taxpayers of Massachusetts and more transparency in how taxpayer money is spent. We definitely could use more Representatives like Shaunna in Boston. Yesterday The Examiner reported that the Obama Administration has warned that as a result of sequestration the National Drug Intelligence Center would lose $2 million of its $20 million budget. The only problem with that statement is that the National Drug Intelligence Center (NDIC) closed on June 15, 2012. The fear-mongering over the cuts, which amount to a pittance of the overall budget, has become the source of humor for many. “Won’t someone think of the kittens?” Twitchy asked. “To listen to the White House if the GOP does nothing by Friday baby seals, baby kittens, baby lambs, baby puppies and baby calves will DIE,” tweeted Rich Galen. Now, we learn that an agency that has been out of business for eight months will have its budget cut. “Might there be other errors in the OMB‘s report?” Riggs (Reason’s Mike Riggs) asked. Government spending is expected to grow from $3.6 trillion to $6 trillion over the next 10 years. Sequestration will cut only 2.4 percent of this spending. Tax increases are no solution. President Obama already grabbed $618 billion in tax increases. These tax hikes harmed opportunity for Americans by increasing taxes on investors and job creators, and yet the budget remains out of balance. Washington has a spending problem—not a revenue problem—and only spending cuts can put the budget on a path to balance. 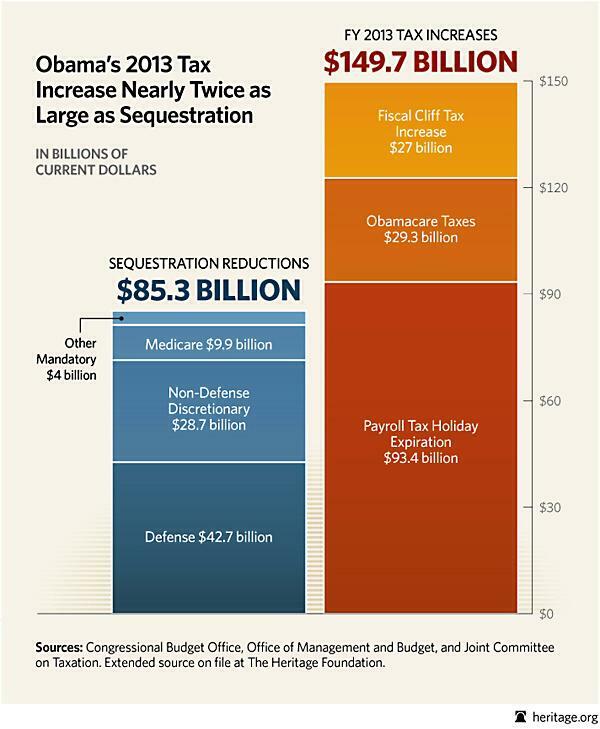 Spending cuts from sequestration and more are necessary. Without them, Americans will suffer even more in the future as economic uncertainty undermines opportunity and as deficits become growth-reducing debt. The good news is that there are smart ways to cut spending to offset sequestration, and at least six bipartisan ways to reform entitlements. The sequester is officially still three days away, but the Obama administration already is making the first cuts, with officials confirming that the Homeland Security Department has begun to release what it deems low-priority illegal immigrants from detention. The move is proving controversial. Immigrant-rights groups say it shows the administration was detaining folks it never should have gone after in the first place, while Republicans questioned the decision-making. U.S. Immigration and Customs Enforcement, the agency that runs the detention facilities, said in a statement that the “current fiscal climate” has forced it to do a review of spending, and part of that is taking a look at who is being detained. “As a result of this review, a number of detained aliens have been released around the country and placed on an appropriate, more cost-effective form of supervised release,” ICE said in a statement. This is such garbage that there are no words for it. Again, the sequester is a cut in the rate of growth. Even with the sequester the government will spend more money this year than they did last year. To say that prisoners have to be released to cut the budget is nonsense. It is scare tactics of the worst kind. This is only one example of what happens in Washington when you attempt to cut federal spending by even a small amount. The President should be ashamed of himself. I am posting this article because I honestly do not know what the truth of the matter is. I saw some people interviewed on television today regarding this, and I honestly don’t know if their objections are valid or not, so here is the story. On February 6, Cape News reported on the possible impact of the Falmouth Board of Selectmen’s decision last week to remove the two town-owned wind turbines at the wastewater treatment facility. The article stated that the removal of the turbines might have an impact on other planned projects throughout the nation. The Falmouth Wind Turbine Options Process reported that removing the turbines would cost the town $9 to $9.4 million. Last week, Assistant Town Manager Heather B. Harper told selectmen that number could be as high as $11.9 million. Town Manager Julian M. Suso said yesterday that there are many unknowns about the process of removing turbines. “Some work lies ahead to be certain what costs are appropriately in that figure,” he said. Falmouth is seeking help from the state to relieve some of the financial burden of removing the turbines. Last week, Mr. Suso sent a letter to Massachusetts Clean Energy Center Chief Executive Officer Alicia Barton McDevitt, asking for relief from some of the money owed on the town-owned turbines. He asked the Massachusetts Clean Energy Center to consider relieving the town of any obligation to repay the $1 million in renewable energy credits that will not be produced if the turbines are removed. At the same time Falmouth is reaching out to state representatives for help paying the debt associated with the turbines. “The board has directed that we contact other appropriate state officials regarding further assistance to the Town in regard to the very significant financial obligation related to this removal and dismantling,” Mr. Suso wrote in a letter to the Clean Energy Center. If Falmouth voters agree to remove the turbines, it could be the first case anywhere in the country of commercial-sized turbines coming down within three years of being installed because of noise and health complaints of residents. Massachusetts did a Wind Turbine Health Impact Study in January 2012. I am not a scientific type, but after reading some of the study, it seems as if there is a strong possibility that wind turbines can negatively impact the sleep of the residents who live near them. The couple I saw interviewed on television specifically stated that their sleep had been disrupted. other words, it is possible that noise from some wind turbines can cause sleep disruption. 3. A very loud wind turbine could cause disrupted sleep, particularly in vulnerable populations, at a certain distance, while a very quiet wind turbine would not likely disrupt even the lightest of sleepers at that same distance. But there is not enough evidence to provide particular sound-pressure thresholds at which wind turbines cause sleep disruption. Further study would provide these levels. 4. Whether annoyance from wind turbines leads to sleep issues or stress has not been sufficiently quantified. While not based on evidence of wind turbines, there is evidence that sleep disruption can adversely affect mood, cognitive functioning, and overall sense of health and well-being. I am not opposed to alternative energy. I am opposed to pushing a form of alternative energy before we get the bugs worked out of it. This will be a rather expensive boondoggle for Falmouth and probably for the Commonwealth of Massachusetts. The Financial Times reported yesterday that American increased the amount of oil it imported from the Middle East last year. The article reports that by the end of November the U. S. had already imported 450m barrels of crude oil from Saudi Arabia, more than we imported in 2009, 2010, or 2011. This is the first time since 2003 that Saudi Arabia has accounted for more than 15 percent of America’s oil imports. The Gulf region accounted for more than 25 percent–a nine-year high. This is happening at the same time that demand for crude oil has declined slightly since 2004 due to increased efficiency, an economic slowdown, and the increased use of natural gas. This is foolish on the part of America. Because of our dependence on Middle-Eastern oil, we are forced to make political and foreign policy decisions that are not in our best interest. Whether we choose to acknowledge it or not, there is currently a clash of civilizations between western freedom and Islamic nations and radicals that do not support freedom. We are supporting these radicals with our oil purchases. If you look at the changes in the United Nations over the past thirty years, you will find that the new empowerment of Islamic groups was financed by Americans buying oil. The anti-Semitism that has ruled the United Nations in recent years is funded by Americans buying Middle East oil. Saudi Arabia, who is an awkward ally at best, is one of the major financial backers of terrorism and extreme Islam around the world, and we keep giving them oil money. It is time for America to declare its energy independence. That does not mean wind and solar–so far they do not work. We live in a carbon-based world economy. We might as well acknowledge this and get on with life. The Keystone Pipeline would be a positive step in that direction. Yesterday the New Orleans Times-Picayune reported on some comments Louisiana Governor Bobby Jindal made after the governors met in Washington. If sequestration cuts go into effect, the White House said that Louisiana schools and childrens’ programs would lose millions of dollars, 7,000 civilian department of defense employees would be furloughed, and other programs supporting crime prevention, children’s vaccines, and domestic violence victims would lose crucial funds. Are we supposed to believe that when you cut 2.5 percent of the federal budget (not to mention that some of this is not cuts–it is a cut in the rate of growth) one of the first things to be cut is schools and children’s programs? How about asking President Obama to see if he can limit some of his trips on Air Force One? How much did the taxpayers pay to send Michelle Obama to the Oscars? How much is the government paying in tobacco subsidies? Have you noticed that legally the President’s salary is immune from the sequester? What about congressional pay? What about the golf or vacation budget? Yesterday Mary Katharine Ham posted an article at Hot Air about Michael Arrington, a prominent tech blogger, who sold his site Tech Crunch to AOL in 2010. Mr. Arrington lives in Seattle, Washington, and recently bought a boat. The boat was made in Canada, so Mr. Arrington had to fill out paperwork with the Department of Homeland Security (DHS) in order to bring the boat into America. When Mr. Arrington went to pick up his boat and fill out the forms, there was a problem with the forms. The primary form, prepared by the government, had an error. The price was copied from the invoice, but DHS changed the currency from Canadian to U.S. dollars. Mr. Arrington suggested that the DHS change the form so that the amount would be correct. Mr. Arrington points out that the form has language at the bottom with serious sounding statements that the information is true and correct, and a signature block. Since he was being asked to swear that the information on the form was correct, he thought that the information on the form should be correct. The article then explains that the DHS agent called another agent over and stated that Mr. Arrington would not sign the form. Mr. Arrington asked to speak to that agent to give them a more complete picture of the situation. She wouldn’t allow that. The agent then seized the boat and took possession of it. A person with a gun and a government badge asked me to swear in writing that a lie was true today. And when I didn’t do what she wanted she simply took my boat and asked me to leave. And, if it’s this hard for a well-educated and well-heeled citizen who can get a lawyer to navigate the system, there are many more with fewer advantages dealing with this kind of abuse at every level about whom we never hear. Please follow the link above and read the entire article for a very insightful perspective on American bureaucracy. I have no idea how to deal with the runaway bureaucracy we have created in this country, but I do know that we need to deal with it before it gets worse. A law-abiding citizen had his boat temporarily seized because he tried to correct a government mistake in the paperwork. That is not the America I grew up in. Can We Elect More Senators Like This? The Courier-Journal in Louisville Kentucky reported on Thursday that Senator Rand Paul is returning $600,000 to the U.S. Treasury. He saved the money on Senate office operating expenses during the past year. The $600,000, which amounts to about 17 percent of Paul’s $3.5 million office budget, was in addition to about $500,000 he saved two years ago, his first year in the Senate, Paul said. He said he also keeps close watch on travel expenditures and noted that, although he frequently flies between Washington and Kentucky, his staff seldom does. He said he also doesn’t pay his staff excessive salaries. The article lists a number of Senators in both parties who have returned money to the government. That is a start. The Center for Security Policy posted an article earlier this month about a court case in Washington, D. C., regarding the book, Muslim Mafia: Inside the Secret Underworld that’s Conspiring to Islamize America. The book, published by Dave and Chris Gaubatz, is an exposé on CAIR (Council on American-Islamic Relations). In 2008, Dave Gaubatz, an experienced federal investigator, was hired as an independent contractor to assist with a field research documentary. As part of this research, Dave Gaubatz trained his son, Chris Gaubatz, to work undercover as an intern with CAIR, which required Chris to wear an audio-video recorder on his clothing to obtain recordings of the routine activities of a CAIR intern. During this internship, it became clear that both a major fraud occurred within the organization and that CAIR officials were attempting to cover it up. Subsequently, Dave Gaubatz published a book entitled, Muslim Mafia: Inside the Secret Underworld that’s Conspiring to Islamize America, which was an exposé on CAIR. Shortly after the book was published, CAIR filed a lawsuit in federal court in Washington, D.C., against Dave and Chris Gaubatz. CAIR then amended its lawsuit to add CSP (Center for Security Policy) and several of its employees, who were involved in the production of the documentary. CAIR’s lawsuit alleges violations of various federal wiretap and hacking statutes as well as several common law torts, such as breach of fiduciary duty and trespass, among others. CAIR has requested to extend the discovery period, which had been ongoing for over thirteen months in order to depose Mr. Paul Sperry, David Gaubatz’s co-author of the book, and World Net Daily, which published the book. The Court denied CAIR’s motion, and will soon set a schedule for motions that could bring this case to a close by ruling in favor of Defendants and exposing CAIR as the center of a Muslim Brotherhood, mafia-like organization. The thing to learn here is that CAIR (which promotes the introduction of Sharia Law into the American legal system) is not a benign organization. CAIR is well aware that Sharia Law is incompatible with democratic freedom and is working to end the freedom of Americans to speak freely. Under Sharia Law, anything that is unflattering to Islam or Mohammad is considered slander, whether or not it is true. Slander can be punishable by death. This is not something we want to enter America’s legal system. I suspect I will have more suggestions for budget cuts in the near future, but I thought I would start with this one. I don’t like all of sequestration, but I do like the idea that the rate of growth (this really isn’t about cutting spending–Washington doesn’t know how to do that) of the federal government can be cut. This is an old article–it’s from November 2012. It was posted at Watchdog.org. The link here is the home page of the National Renewable Energy Laboratory – NREL. The wonderful, dedicated people who work at NREL describe it as the U.S. Department of Energy’s primary national laboratory for renewable energy and energy efficiency research and development. So far so good. So what is the problem? NREL’s top executive, Dr. Dan Arvizu, makes close to a million dollars per year. His two top lieutenants rake in more than half a million each and nine others make more than $350,000 a year. But what is really going on there? Energy expert Amy Oliver Cooke drove out to the site, which looks something like Nevada’s Area 51 with its remote location and forbidding concrete buildings. NREL had started a construction project and Cooke wanted to see for herself. She didn’t get far: a man in an SUV seemingly appeared out of nowhere, stopped her car, and told her to leave. Why is this top secret and who decided how much to pay these people? With its bloated budget and overseen by a $533 million a year government-funded management company, Cooke isn’t buying it. “NREL has given us two of the most significant boondoggles, one of them being ethanol and the other being (bankrupt) Abound Solar,” she said. “They were part of the team that pushed Abound Solar along. In fact, they wrote in March 2011 on their website how proud they were of their role in abound solar. I think I have a suggestion as to a place where the federal budget may be cut. Please read the entire article to discover where a large chunk of your tax money is going. Yesterday the New York Post posted an article about some of the consequences of Mayor Bloomberg‘s ban on serving or selling sugary drinks in containers larger than 16 ounces. That ban means that when you call your local pizzeria for a delivery, that delivery cannot include the standard 2-liter bottle of Coke (which you can legally buy in the grocery store). Typically, a pizzeria charges $3 for a 2-liter bottle of Coke. But under the ban, customers would have to buy six 12-ounce cans at a total cost of $7.50 to get an equivalent amount of soda. There is some serious food for thought in the fact that you can no longer get a 2-liter bottle of soda with your pizza. First of all, how many people are going to eat the pizza? If the entire pizza is going to be eaten by only one person, the large bottle of soda is the least of his worries. If the pizza is going to be shared, can we also assume that the soda is going to be shared? Therefore, how can the city know that any one person eating the pizza and drinking the soda will actually get more than 16 ounces of the soda? Therefore, the law probably should not apply. Families will get pinched at kid-friendly party places, which will have to chuck their plastic pitchers because most hold 60 ounces — even though such containers are clearly intended for more than one person. Changes will be made at the Frames bowling alley in Times Square, where 26-ounce pitchers are served at kids’ parties, said manager Ayman Kamel. “We’re going to try to get creative,” he said, noting drinks with 100 percent juice are exempt from the ban. At this risk of totally skewing the issue, what happens to bars that provide pitchers of beer to tables of patrons? Is beer subject to the same restrictions as soda? Does beer have sugar? Do the carbs in beer count as sugar? Has anyone ever been arrested for driving under the influence of Coca-Cola? This ban is an exercise in stupidity and unintended consequences and needs to be repealed. The Wall Street Journal posted an editorial today entitled, “ObamaCare and the ’29ers. '” When I first looked at the title, I thought it was about the unemployment rate of the twenty-something generation. It’s not. 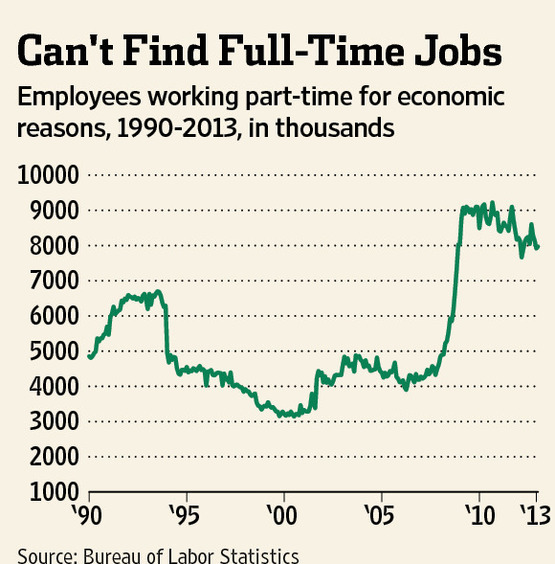 It’s about how ObamaCare is affecting the number of hours employers allow their employees to work. The law (ObamaCare) requires firms with 50 or more “full-time equivalent workers” to offer health plans to employees who work more than 30 hours a week. (The law says “equivalent” because two 15 hour a week workers equal one full-time worker.) Employers that pass the 50-employee threshold and don’t offer insurance face a $2,000 penalty for each uncovered worker beyond 30 employees. So by hiring the 50th worker, the firm pays a penalty on the previous 20 as well. Is Washington capable of making anything simple? The savings from restricting hours worked can be enormous. If a company with 50 employees hires a new worker for $12 an hour for 29 hours a week, there is no health insurance requirement. But suppose that worker moves to 30 hours a week. This triggers the $2,000 federal penalty. So to get 50 more hours of work a year from that employee, the extra cost to the employer rises to about $52 an hour—the $12 salary and the ObamaCare tax of what works out to be $40 an hour. It’s time to repeal ObamaCare, replace it with something that has actually been thought through, and get the American economy working again. A Backdoor Approach To Limiting The Right Of Veterans To Own Guns ? For the past day of so, a number of ‘facebook friends’ have posted links to articles about veterans being denied the right to own guns. I waited to post this article until I saw the letter involved and was able to see who sent it. The Blaze posted the story on Friday along with a copy of the relevant letter. The letter was written by the Oregon Department of Veteran’s Affairs. “A determination of incompetency will prohibit you from purchasing, possessing, receiving, or transporting a firearm or ammunition. If you knowingly violate any of these prohibitions, you may be fined, imprisoned, or both pursuant to the Brady Handgun Violence Prevention Act, Pub.L.No. 103-159, as implemented at 18, United States Code 924(a)(2).”? Sequestration will take effect on Friday, March 1.To hear President Obama describe it, sequestration will be the end of life as we know it in America. There were two articles posted in the Washington Post on Friday–one written by George Will and one written by Bob Woodward. George Will describes sequestration as a manufactured crisis, and Bob Woodward states that sequestration was initiated by Jack Lew, Rob Nabors, and President Obama (contrary to the claims of the President that it was the Republican’s idea). This was an acknowledgment that the president and Lew had been wrong. In fact, the final deal reached between Vice President Biden and Senate Minority Leader Mitch McConnell (R-Ky.) in 2011 included an agreement that there would be no tax increases in the sequester in exchange for what the president was insisting on: an agreement that the nation’s debt ceiling would be increased for 18 months, so Obama would not have to go through another such negotiation in 2012, when he was running for reelection. So when the president asks that a substitute for the sequester include not just spending cuts but also new revenue, he is moving the goal posts. His call for a balanced approach is reasonable, and he makes a strong case that those in the top income brackets could and should pay more. But that was not the deal he made. Make no mistake–the purpose of all this panic is to create an atmosphere where Americans are willing to raise taxes–even on the middle class. The tax increases will be on everyone. 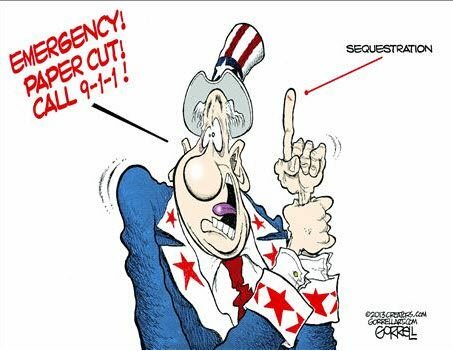 The panic over sequestration is necessary to pave the way for those taxes. As I said, we have been here before. Yesterday CNS News posted an article suggesting a real solution to our current budget crisis. As I have previously stated, all of the doomsday forecasts about sequestration are simply another example of the Obama Administration crying wolf. 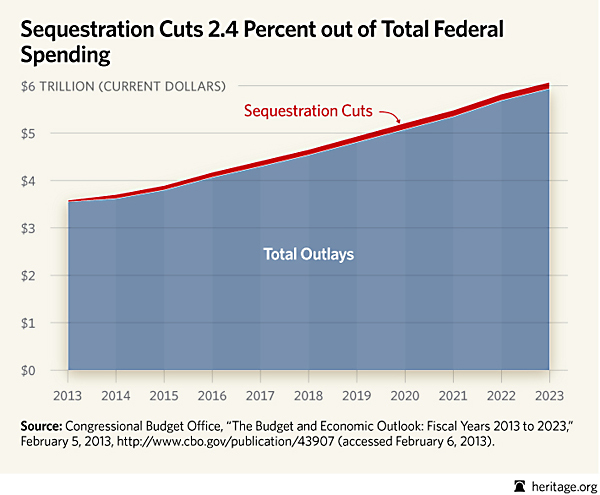 The sequestration does not actually cut spending–it merely cuts the rate of growth. Conservative pundit Charles Krauthammer says President Obama could easily reduce the fear and panic engendered by the looming sequester if he would simply push Congress to pass a bill allowing a transfer of funds from less important federal accounts to more important federal accounts. You can’t cry ‘wolf’ or blame the Republicans if you actually solve the problem. Quite frankly, I am very tired of President Obama telling us that we will all go to hell in a hand-basket if Congress does not do everything he says they should do exactly how and when he says they should do it. There is a reason we have three branches of government, and President Obama does not seem to understand that. This President seems to be acting like a spoiled child who throws temper tantrums when he does not get his own way. My grandchildren stand in the corner for that sort of behavior. I generally see about three movies a year. One of the movies I saw this year was ARGO. It was a fantastic movie. There was some poetic license in telling the story, but for the most part the story was as most Americans remember it. The idea of smuggling out the hostages as part of a movie crew was very creative, and it was wonderful to get them out of Iran alive and without having been tortured. Yesterday the U.K. Mail posted a story about the drawings of the fake movie used to get the Americans out of Iran. The article posted a number of the drawings–they are fantastic. The ‘Argo’ movie illustrations that the CIA used in 1980 to fool Iranian officials into freeing six American hostages have been made available for the first time in decades. Barry Ira Geller was an aspiring producer in 1978 when he purchased the production rights to the science fiction novel ‘Lord of Light‘ by Roger Zelazny, a story set on a faraway planet that was published in 1967. …Chambers and Mendez changed the name of the production from ‘Lord of Light’ to ‘Argo’ and the rest of the story became history, as the plan was successful and all six Americans made it home safely. Geller said he didn’t learn that his script had been used for the top secret mission until 2001. ‘It shows me that we all make a difference in the world,’ he added. Kirby also would have been thrilled to know that his art had made such an impact, Geller said..
‘He would have loved it,’ he said. Geller’s story, which was omitted from the blockbuster movie ‘Argo,’ is now being told in a upcoming documentary by director Judd Ehrlich called Science Fiction Land. Please follow the link above to the U.K. Daily Mail to see the drawings. They are amazing. The article points out that Mr. Brennan’s statement is at odds with the statements made by those who lead the jihadists. The founder of the Muslim Brotherhood, Hassan al-Banna, wrote in a pamphlet titled “Jihad” that “Many Muslims today mistakenly believe that fighting the enemy is jihad asghar (a lesser jihad) and that fighting one’s ego is jihad akbar (a greater jihad).” The present spiritual adviser of the Muslim Brotherhood, Sheikh Yusuf Qaradawi, writes in his book, “Fiqh of Jihad,” that Muslims may engage in violent jihad against Israel. If your next door neighbor continually threatens you, do you ignore the threats or do you pay attention and at least take defensive action? It seems that Mr. Brennan would choose to ignore the threats. Sun Tzu is quoted as saying, “Know your enemy and know yourself and you can fight a hundred battles without disaster.” That is one of the basic rules of war. Whether we like it or not, we are at war. The Islamists have made that clear. We can put someone in charge of the CIA who is in touch with reality or we can put someone in charge who will ignore reality. I believe that John Brennan’s statements, as well as some of his past military actions outside the chain of command (see rightwinggranny.com) should disqualify him for the position of Director of the CIA. Unfortunately I believe he will be confirmed and his appointment will put America at risk. Yesterday Ed Morrissey at Hot Air posted an article about Vice-President Joe Biden‘s comments on the gun control debate. The comments were not particularly helpful to the average American trying to protect his family, but they were interesting. “I said, ‘Jill, if there’s ever a problem, just walk out on the balcony here, walk out and put that double-barrel shotgun and fire two blasts outside the house,’” Biden said. There are a few basic problems with the Vice-President’s suggestion. First of all, as anyone who is an experienced shooter will tell you, what goes up must come down. Rob Wiltbank, a gun rights advocate who founded Delaware Open Carry in 2008, told U.S. News he agrees with the vice president that a shotgun would be good for home protection, but he was also troubled by the hypothetical. The other obvious problem is that after you fire those two shots out of your shotgun you have to reload. Until then you are defenseless. Thank goodness we have the Secret Service to protect this man so that he doesn’t have to follow his own advice. My reason for supporting the Keystone Pipeline is that it will provide a source of energy for America that is based in North America and provided by someone that actually likes America. To me, that is a security consideration and should be considered. However, there are also some very interesting reasons for blocking the pipeline–none of which have any relationship to the environment. And of them, the biggest winner might just be the Burlington Northern Santa Fe, which is owned by Berkshire Hathaway, the conglomerate controlled by Obama supporter and Omaha billionaire Warren Buffett. In December, the CEO of BNSF, Matthew Rose, said that his railroad was shipping about 500,000 barrels of oil per day out of the Bakken Shale in North Dakota and that it was seeking a permit to send “crude by rail to the Pacific Northwest.” He also said the railroad expects to “eventually” be shipping 1 million barrels of oil per day. Isn’t it an incredible coincidence that Warren Buffet, one of President Obama’s biggest supporters, will benefit greatly if the pipeline is stopped. Who will lose? American workers who need jobs. The article points out that because the oil from Canada can be transported by rail (instead of pipeline), American refineries are already being built to handle the increased amount of oil. Stopping the pipeline has no impact on the flow of oil–only on the way it is transported. Therefore, stopping the pipeline has no impact on the environment–in fact the pipeline probably has a lower carbon footprint than the railroad! This story is another example of why you should never assume that the mainstream media is actually reporting the news. That’s why we need the Internet!